Ms. Saleh sets the tone with an icebreaking story, while three dancers improvise fluid shapes around her. She recounts the scandal which erupted upon the public announcement of her marriage to acclaimed Egyptologist Jack Josephson in New York society: “Have you heard? Jack’s gone and married a belly dancer!” But the gossip mongers couldn’t have been more erroneous, for this renowned Egyptian dancer was in fact a prima ballerina widely recognized for her portrayal of the iconic role of Giselle for the Bolshoi Ballet in Moscow. Thus the ice, or the glass ceiling, is cracked wide open! This commences the next “chapter” of Tina Croll and James Cunningham’s From the Horse’s Mouth, performance series which could be cheekily retitled, “From the Camel’s Mouth,” for this installation. What lies ahead is an evening that is non-linear, transcendent and transformative, for it challenges and redefines one’s ideas of Egyptian and Arabic dance and dancers. For nearly two decades, each performance or “chapter” of From the Horse’s Mouth has featured more than 20 performers on stage per event sharing their memories and movement through improvised dance and storytelling based around a particular theme. No two are alike, but this one – which focuses on the myriad facets of Egyptian dance of the past, present and future, with the revolutionary Magda Saleh at its axis, feels especially poignant and relevant to the current epoch. The performances, running Thursday March 15-Sunday March 18, are bookended by two films: “A Footnote in Ballet History,” on classical ballet in Egypt during the Cold War, and “Egypt Dances,” a visual record of the numerous indigenous dance forms of that country, both narrated by Ms. Saleh. 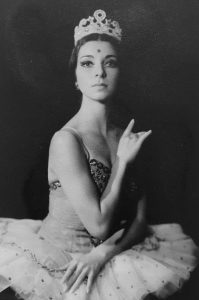 When asked how an Egyptian girl became prima ballerina for the Bolshoi Ballet in Moscow and the Cairo Ballet Company, then Founding Director of the New Cairo Opera House – National Cultural Center, she replies, “Time, place and circumstances,” then hastily adds, “and Tharwat Okasha,” an army officer with foresight and diligence who became the first Minister of Culture of Cairo. Saleh grew up in a time where English, French and Arabic were spoken equally at home and school. Then Egypt underwent a revolution and was suddenly at war with Britain, so British influences fell quickly out of fashion. But in exchange Egypt became cozy with the Soviets who brought their culture, including classical ballet and its famed instructors from the Bolshoi Ballet, right when the Minister of Culture created the Academy of Arts in 1959. Thus Ms. Saleh became an unexpected “footnote” in ballet history, as the film title suggests. But ballet, as beautiful as it is featured by Ms. Saleh, whose single sweeping gesture of a raised arm can take one’s breath away, and the numerous dancers and storytellers who recount their tales: from the humiliation of breaking straps and skirts slipping off (“Janet Jackson you’ve got some competition with wardrobe malfunction!” Diana Hakak, Ms. Saleh’s friend and colleague from their heydays Moscow and Cairo, exclaimed) to personal anecdotes of their favorite memories of Ms. Saleh or their own dancer’s journeys, it is only an element of the numerous dances that comprise Egyptian dance. Other standouts included: Tahtib, an utterly captivating stick fighting sport that is somewhat evocative of Capoeira and circus arts such as juggling, which has been practiced in Egyptian Villages for thousands of years and is finally gaining proper recognition through the efforts of those such as Adel Paul Boulad; Indian Classical Dance, performed with such precision and charisma by Egyptian-American interdisciplinary artist donia salem harhoor, that it seemed certain she was of Indian descent; transfixing Tanoura and Sufi twirling enacted by Yasser Darwish and Paola Garcia; elegant and stately Ballroom and Latin dance from former ballet performer, Safwat M. Gerges; folkloric styles passed down through generations imbued with fusion or sticking to tradition; Modern and Contemporary movements and of course – “belly dance” or raqs sharqi, whose expressions of the most widely recognized form of Egyptian dances were represented by an eclectic variety of artists, from stalwarts of the tradition such as Phaedra and Samara who shimmied in the legendary Ibrahim Farrah’s internationally acclaimed Near East Dance Group to Tokyo-born Mio Takahashi. The costumes range from traditional garb to unitards to three piece suits to torso revealing arrays of brightly colored sequins and were an ever-changing visual feast as the cast of 20 or more burst from the wings through the revolving door of the (undoubtedly jam packed) dressing room. Music played an important part of the evening as there cannot be movement without its auditory inspiration, which was provided by an assortment of recordings of many styles and live accompaniment. The rousing tabla drum and double reed mizmar played by Mohamed Salem and Haitham Mohamed Amin sparked further excitement and power in the dances. There was even a tender and haunting aria sung by Egyptian-American soprano Christine Moore Vassallo by Egyptian composer Halim El-Dabh, who wrote music for The Martha Graham Company, about his son “Habib,” which is also the word for “darling” in Arabic. But perhaps what is most important and viable, and what Magda Saleh has spent her life outside of performing supporting, is not the past but the future of Egyptian and Arabic dance. For this we look toward many of the talented dancers, creators and choreographers participating, with notable torch bearers: Iraqi-born, Lebanon-raised Fadi J Khoury and his Turkish-born partner Sevin Ceviker of the FJK Dance Company and Egyptian-born multidisciplinary performer, director and academic, Adham Hafez of the Haraka Group – all creating and performing in New York City and worldwide, but who have faced difficulties creating the work and statements they want to make in their native lands. What allies and enemies real or abstract might be influencing their choices and challenges the way that British, French, then Soviet and now American influences shaped Ms. Saleh’s Egypt? Of all of the truly incredible dancers, Mr. Khoury and Ms. Ceviker were the most striking. Watching them dance is akin to observing tigers in the jungle. In their solos or duets together they transitioned seamlessly from ballet, Modern, Contemporary, and Ballroom dance styles with an Arabic sensibility while exuding grace, utter confidence and dripping with sensuality. FJK Dance Company utilizes all of these styles to tell the story of the body, movement, emotion and touch from a distinctly Arabic perspective. “Touch” is an important element, because certain touches that are seen as forbidden or inappropriate, especially between men and women, are common and necessary in dance – particularly Ballroom – and this is what fascinates and informs FJK Dance Company’s mission and aesthetic. Mr. Khoury stumbled upon Ballroom and Latin dance much like Safwat M. Gerges – both trained at the Arthur Murray Dance Center when they came to the U.S. and needed to find steady work as dance teachers, then fell in love with the form. Ms. Saleh has experienced similar struggles – “We are all artistic refugees,” she explains about herself and other Arab artists. “We had to flee our own countries to make the art we want to.” What is clear from this transformative, uplifting, often humorous and moving saga of an evening and the events that surrounded it, is that the myriad expressions Egyptian and Arabic dances are diverse and thriving and that the upholders of the past are supporting and inspiring the next generation of its bold and multifarious future.